One more day! Yaaaay! Are you all packed and ready for the drive to Clemson to see your Tigers play in Death Valley for the first time this season? This time of year is so exciting... We're hoping the weather Saturday cooperates! 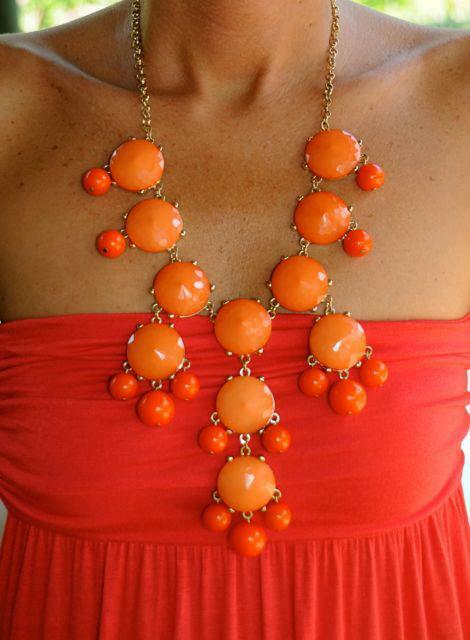 Today, a lucky Clemson Girl reader has a chance to win this gorgeous (and very trendy) orange bubble, statement necklace from Two Sisters Boutique. If you are in Clemson this weekend for the game, please make a point to stop by Two Sisters Boutique in downtown Clemson. They have a big selection of all things orange and purple in gameday fashion, accessories and jewelry. The owner of Two Sisters Boutique is offering all Clemson Girls 10% off their order in store this weekend. All you have to do is stop by and mention you heard about Two Sisters Boutique on ClemsonGirl.com to get your discount! Meanwhile, celebrate Solid Orange Friday by entering to win this gorgeous orange bubble necklace - a perfect compliment to any gameday outfit! Deadline for all entries is midnight tonight, Friday, Sept. 7th. We will randomly draw a winner Saturday, Sept. 8th and contact the winner by email. The winner will have 72 hours to contact us after we send the email or we will draw a new winner. Special thanks to the fabulous and chic Two Sisters Boutique for sponsoring today's giveaway! Stay tuned today to the blog for a special post from our Sports Bloggess Nikki.